Anyone in frequent use of music transfer between iPhone & Mac may well consider an iTunes alternative Mac to facilitate the whole transfer process, this is not only due to the unexpected crashes of iTunes 12 that stops your transfer halfway, but also because other little headaches like iTunes not recognizing iPhone, iTunes not working for which the software stability is to blame. 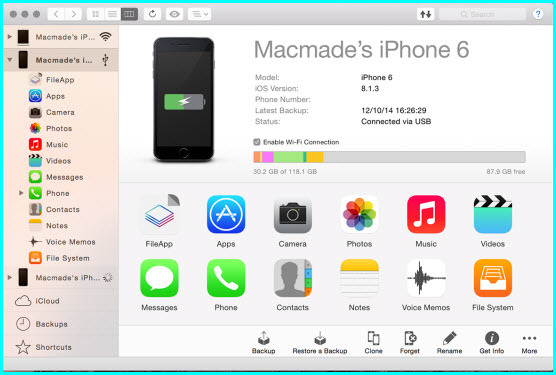 Why DearMob iPhone Manager is the Best iTunes Alternative for macOS? Fitting superfast music transfer between iPhone & Mac (macOS Mojave) into a 20.87 MB *.exe file, DearMob's iPhone Manager occupies only 1/5 the place that iTunes does on Mac. 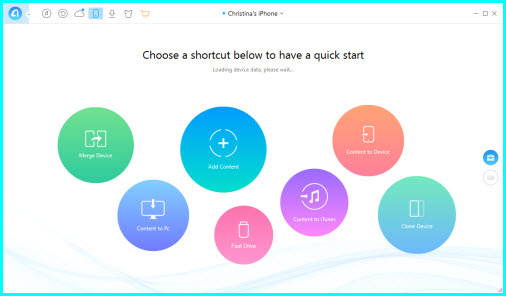 As a lightweight iTunes alternative Mac, DearMob iPhone Manager eliminates such problems as iTunes freezes halfway, iTunes unable to force quit, instead, it renders smooth music transfer between iPhone XS/XR/8/7 etc and Mac in MP3, AAC, FLAC, WMA, etc. If you've already played with iTunes once, chances are that you already know iTunes adopts a "syncing" way of transferring music from Mac to iPhone – that been the case – it's at least somehow risky if you stay with iTunes for the music transfer. However, DearMob iPhone Manager is not only based on a more secured transfer channel, but also it speeds up the flow – leaving rarely any space for data interruption to happen. 3. Possesses a Mac computer with iTunes & associated drivers. MacX MediaTrans offers 3 flexible packs for you to choose & download, it's $29.95 for 1 1-year-license on 1 Mac, $35.95 for life-time-license on 2 Macs, and $65.95 for life-time-license on 6 Macs. This stellar piece of gadget is in real terms more than just an iTunes alternative for Mac: Aside from the basic music, voice memo, ringtone making functions that you can rely on iTunes to do, it's a second-to-none choice for photo transferring between iPhone and Mac, indeed an overachiever if you're thinking of setting iTunes aside. Users who'd settle with iMazing can save a little when compared to the following options - $34.95 each with a free trial enabling anyone to transfer 50 items for free between iPhone and Mac (not per day). Just like DearMob iPhone Music Manager, it works well with 2-way music transfer. Yet unlike MacX MediaTrans, iMazing won't work with ebooks transfer (top 8 ebooks website to download ebooks for iPhone), which makes this alternative to iTunes for Mac less attractive to book buffs. 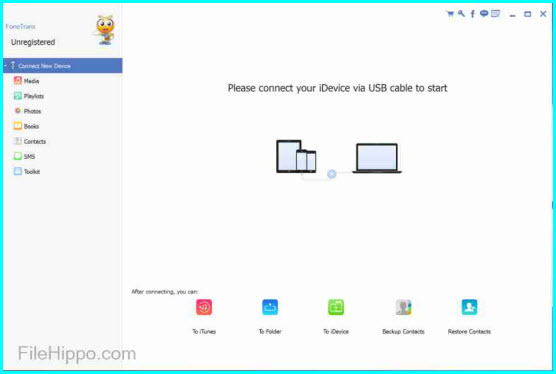 Highlight of iMazing, however, is that it provides services to create a backup of iPhone date, and restore a backup to iPhone wirelessly, and without a dime – which give another reason for users searching for an iTunes alternative Mac to do backups to choose this gadget. $39.95 each doesn't make iMobie Anytrans an inexpensive iTunes alternative for Mac, but that it's indeed a product of efficiency worth trying. Although iMobie gives a 7-day free trial for this iTunes Alternative mac, it keeps presenting a 10-seconds ad before each of your move. This iTunes alternative mac now in its version 5.5.4 and offers relatively full-fledged functions as you can do with iTunes for Mac (macOS Mojave). Under the category iTunes Library alone, this alternative software sorts your music files into 13 categories including playlist, Music, Movies, Home Videos, TV Shows, Podcast iTunes U, Books, Audiobook, Apps, Tones, Voice Memos. 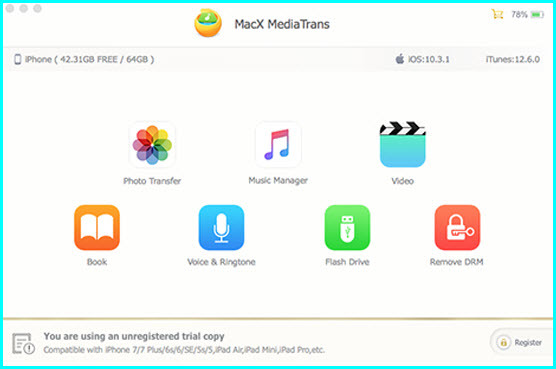 The release of FoneTrans is indeed a gap-filling design that any iTunes alternative Mac isn't shipped with yet: By enabling direct transfer between 2 iOS devices, FoneTrans allows you to transfer everything from iPhone 7 to iPhone 8 without external help – thus decreasing user's dependence on iTunes for data transfer while also make the whole process time-saving. Granted, the price $49.95 each for an iTunes alternative Mac seems a bit like overcharging when it offers phone-2-phone transfer of music, videos, photos, contacts, voice memos, but it somehow missed the transfer of bookmarks, reminders, and recent calls, hence some steps away from complete iPhone backup. That's about the end of what we've reviewed for iTunes alternative Mac today. Now that this article is released in an ascending order of product prices, you may compares the respective functionalities, missing features together with the respective prices. If DearMob iPhone Manager is the iPhone data solution thatyou decide to settle with, chances are that you may not only need to transfer music from computer to iPhone, but also add ringtone to iPhone (30s at most). Also save a little expectations for the pro version of this music manager software to come out soon. How to Solve iTunes Cannot Read iPhone Contents?